President Donald Trump said Friday that the planned summit with North Korea in Singapore is back on, roughly one week after the president sent a letter to Kim Jong Un calling off the planned June 12th summit. The announcement came after an envoy of North Korean officials hand-delivered a letter to the president from North Korean leader Kim Jong Un. "We'll be meeting on June 12 in Singapore. It went very well," the president told reporters following the letter-delivery. "The relationships are building and that's a very positive thing. Kim's top adviser and former North Korean spy chief, Kim Yong Chol, delivered the letter himself after a rare diplomatic visit to the United States to meet with Secretary of State Mike Pompeo in New York. The visit marks the second time in history a North Korean official has visited the White House. Kim Yong Chol spent roughly one hour and twenty minutes at the White House and emerged from the Oval Office with Trump and Pompeo to take photos and shake hands. Pompeo and Chief of Staff John Kelly were also spotted inside the Oval Office for the meeting with President Trump. 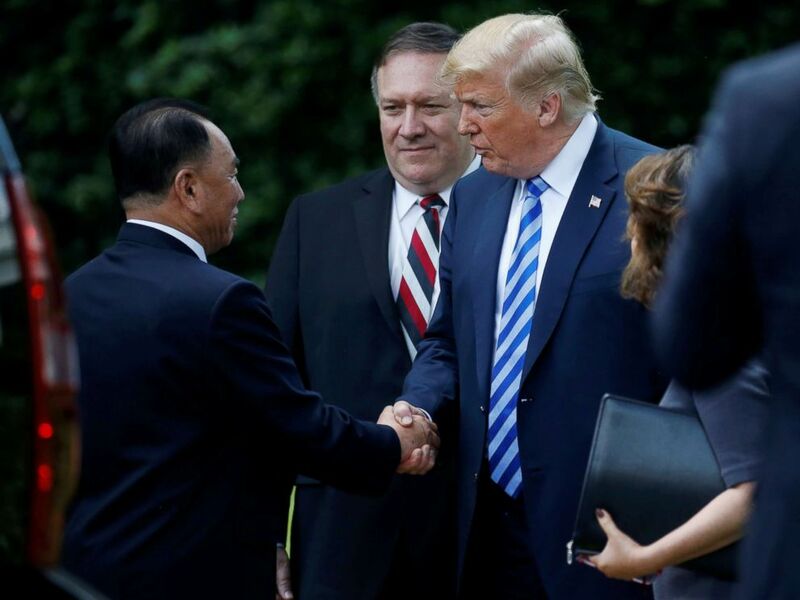 North Korean envoy Kim Yong Chol shakes hands with President Donald Trump as Secretary of State Mike Pompeo looks on after a meeting at the White House June 1, 2018. While the contents of the letter are unclear, Trump said the letter from Kim was "very interesting" calling it a "very nice letter." The letter from Kim Jong Un had to first be inspected by US officials before it was delivered to the president, a White House official confirmed. Trump cautioned on Thursday that while he hopes a planned summit in Singapore on June 12 between the U.S. and North Korea is still in the cards, he wants it to be a "meaningful" meeting. The president even said he's contemplating two or three meetings with Kim Jong Un if everything goes well and there is more progress to be made. "That doesn't mean it gets all done at one meeting, maybe you have to have a second or third and maybe we'll have none, but it's in good hands, that I can tell you," Trump said. 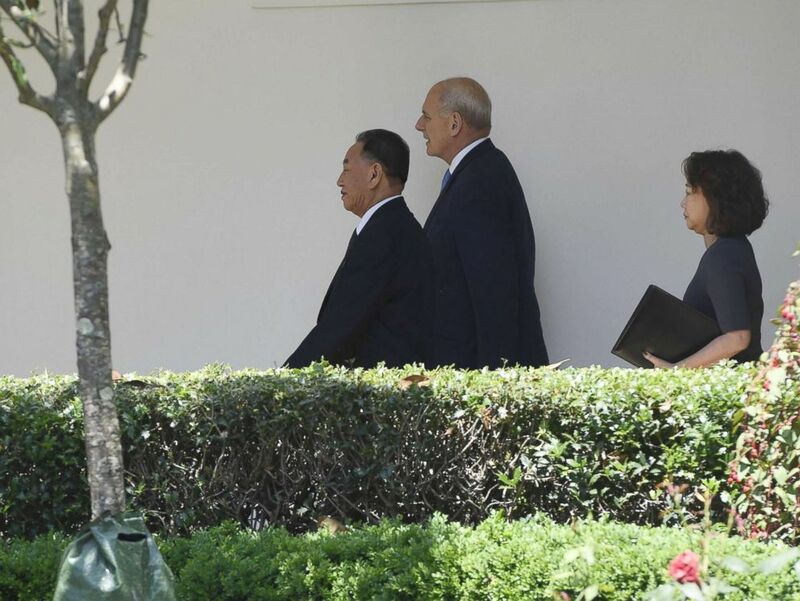 White House Chief of Staff John Kelly, center, escorts North Korean Kim Yong Chol, left, to the White House, June 1, 2018, for a meeting with President Donald Trump. Since the president "canceled" the summit in a dramatic letter last week, and there's been a flurry of activity between the two countries to officially make it happen. Trump tweeted Tuesday that is cancellation letter got a "solid response." Kim Yong Chol is the highest ranking North Korean official to visit the United States in nearly two decades. Eighteen years ago, then-President Bill Clinton hosted a top North Korean military official in the Oval Office to receive a letter from Kim Jong Un’s father – Kim Jong Il. There were promises of peace and cooperation and even talk of a summit. But a meeting never came to be – and no sitting president has met with a North Korean leader since.